Scotland launching a qualifying campaign for a major championship with a tricky away tie. 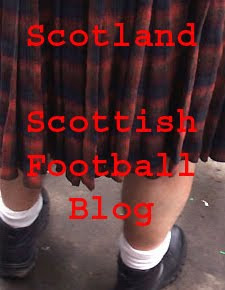 What can possibly go wrong for Craig Levein's bravehearts? Loads and loads and loads can go wrong. But it doesn't do to look at a glass half empty. No. Onwards and upwards. Hmmm. A few things spring to mind. David Weir's return makes him Scotland's oldest ever player. It's a remarkable achievement for him and it should return a certain stability that was lacking in the back four that played against Sweden. But it's a fairly depressing indictment of the talent available to Levein. Lee McCulloch will be the holding midfielder in a 4-1-4-1 formation. It's a return to favour for the a player who looked to have ended his international career. I'm a touch surprised that Paul Hartley wasn't picked in that role but it would seem to be a position that suits McCulloch. And Steven Naismith is back after a long absence from the starting line-up, meaning there is no place for James McFadden, whose reputation as a talisman might just be slipping a bit after more than a few anonymous displays. Still, not a selection I was predicting. Whittaker (slightly worried that a defender who doesn't always inspire confidence will be playing on the other flank from his normal berth) and Hutton will be expected to get forward from full back and, with McCulloch sitting in, the rest of the midfield must offer support to Kenny Miller, restored his traditionally lonely role up front. We've also got a right to expect that Miller will have brought his early season domestic form with him to banish memories of his apparent profligacy at this level. It's not a team that has got me shouting from the rooftops. But it was never going to be. And there's a lot of changes from the Sweden game. That has to be a positive. Organisation and spirit: the two things I thought Levein could bring to Scotland. Well, now is the time to start showing that he can deliver. Lithuania are no mugs. But a defeat tonight and we might as well give up. It's a Scotland team that looks like it has been designed to be cautious. But they can't be too cautious because a draw would be a big blow to our chances of getting second place (if I'm be presumptuous enough to expect Spain to win the group). I'm almost entirely unmoved by the prospect of tonight's game. But I want some excitement, some sense of anticipation. I think we all do. So there's the challenge: these are the eleven men who need to restore the pride, the passion, the reasons to believe. Don't let us down, boys. > I can't get excited but I can still moan. Friday night internationals. Gie's a break. Friday nights are for either a restorative nap or a barrel load of beer. Although, now that I think about it, Scotland are probably capable of inspiring both.